Portugal's Azores archipelago is bracing for Hurricane Gordon which had intensified to Category 2 and is forecast to hit the eastern-most islands early on Monday. Additional weakening is forecast but Gordon is still expected to be a hurricane when it passes near or over the eastern Azores. It is expected to weaken to Category 1 before it passes close to Santa Maria and Sao Miguel islands. Category 1 hurricanes have enough strength to uproot trees, blow off poorly attached roof tiles, cause coastal flooding and power outages. Maximum sustained winds have decreased to near 155 km/h (100 mph) with higher gusts. Hurricane force winds extend outward up to 55 km (35 miles) from the center of the system and tropical storm winds extend outward up to 205 km (125 miles) from the center. the estimated minimum pressure is 973mB. At 12:00 UTC, the center of Hurricane Gordon was located near latitude 35.1N and longitude 30.7W. Gordon is moving eastward at speed of 37 km/h (23 mph). A turn toward the east-northeast is expected later today. Gordon is expected to be near or over the islands of the eastern Azores early Monday. Hurricane warning is issued for eastern Azores. The civil protection service is on red alert in the two eastern islands and on medium alert in the central archipelago. Gordon is expected to produce total rainfall amounts of 3 to 6 inches over the central and eastern Azores. Swells generated by Gordon are expected to cause dangerous surf and rip current conditions. The Azores are a group of islands in the middle of the Atlantic Ocean (about 2 hours flying from Portugal). 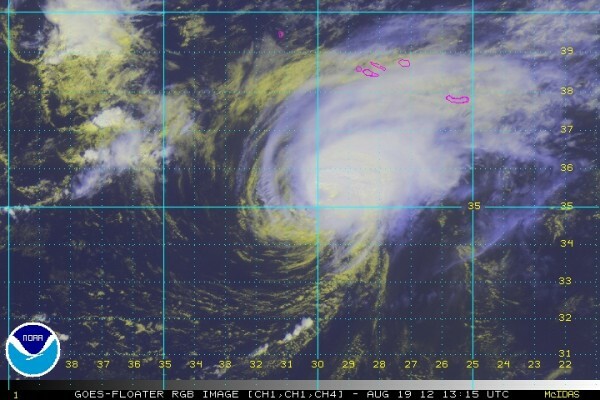 The last hurricane to have reached the Azores, in 2006, was Category 1 and also named Gordon. It caused little damage.